Large villa with heating pool. A large open lovely villa with a heated pool and wonderful patios. The pool is open and warm between May and September. Very close to both the archipelago and the lake. Only 20 mins to Stockholm City. 5 bedrooms or 4 bedrooms and 1 gym. Large villa with many places to relax. Use the garden, use the villa, use the pool, use the outhouse, ENJOY! Bedroom 5 can be used as a gym or two beds, either or the other. Bus stop within 5 mins on foot. Grocery store within 10 minutes on foot. Bathing place within 5 mins on foot. Kjempefin feriebolig med trivelige uteplasser på terrassen rundt huset. Huset har perfekt beliggenhet for en familieferie i ett hyggelig boligområde med gangavstand til fin badeplass i nærområdet. Bassenget og uteområdet er alt en kan drømme om når en skal ha en avslappende ferie. 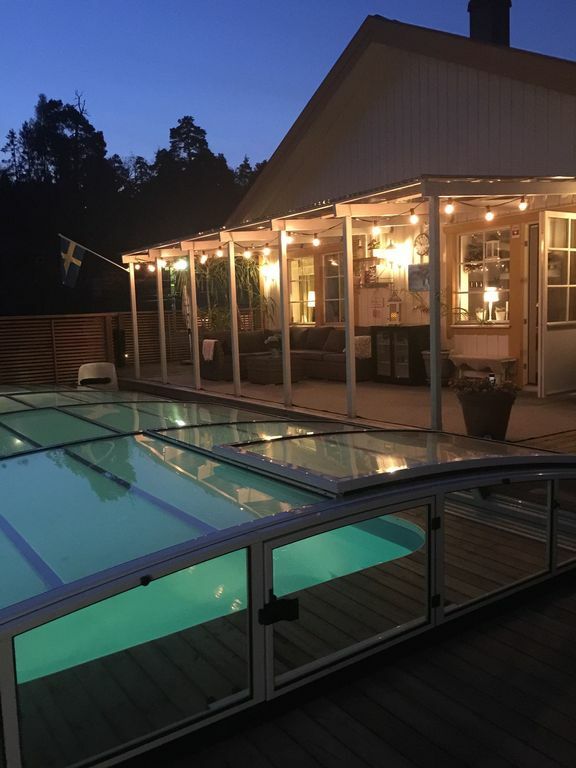 Vi sitter igjen med bare gode inntrykk av dette feriehuset.